Selangor, Malaysia, June 19, 2014 - (ACN Newswire) - Adding lime is a cost-effective means of increasing rice production on marginal acidic soils, according to a study published in the Pertanika Journal of Tropical Agricultural Science. The study examined the effects of applying lime from various sources on an acid sulphate soil in Merbok, Malaysia. Rice is a staple food for Malaysians. With global demand for rice increasing, Malaysia needs to become more self-sufficient in rice production. However, with fertile land in short supply, farmers may need to increase their rice production on land that was previously idle and less fertile, such as the acid sulphate soils that occur along Malaysia's coastal plains. Marked with high acidity (soil pH< 3.5), acid sulphate soils contain high levels of aluminium (Al). Under normal circumstances, they are not suitable for crop production. Major agronomic problems common to these soils include Al toxicity, decreased availability of phosphorus, nutrient deficiencies and iron toxicity. In the study, Shamshuddin Jusop and colleagues at the Universiti Putra Malaysia treated an acid sulphate paddy with ground magnesium limestone (GML), hydrated lime and liquid lime. Prior to the treatments, the pH of water from the rice field was 3.7 and the Al concentration was 878 uM. 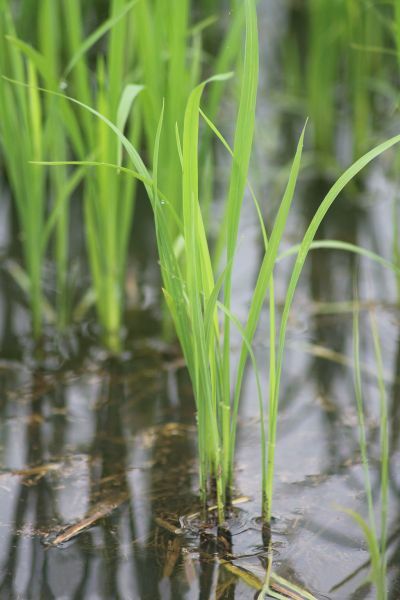 Rice plants grown under these conditions would normally suffer from acid and aluminium stress, thus retarding and/or minimizing rice growth and yield. For their experiment, the researchers tested paddy variety MR 219 - the most common variety grown in Malaysia. In the first season, rice plants were affected by drought while in the second, they were infested with rice blast fungus. Despite this, the rice yield was 3.5 tons (t) per hectare, or almost as much as the average national yield of 3.8 t per hectare. This was achieved by applying 4 tons of GML per hectare, at a cost of US$382. Since one ton of rice sold at the market price of US$318, "the yield obtained is worth the effort and cost," the authors conclude. Tel: +603 8947 4865; Mobile: +(6) 017 889 1178.